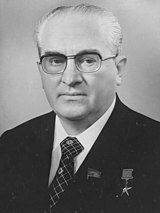 Polaiteoir Rúiseach i laethanta an Aontais Shóivéadaigh ab ea Yuri Vladimirovich Andropov (Rúisis: Ю́рий Влади́мирович Андро́пов) (15 Meitheamh, 1914 – 9 Feabhra, 1984). Bhí sé ina cheannaire ar an Aontas Sóivéadach ar feadh cúig mhí dhéag idir an 12 Samhain, 1982 agus lá a bháis sa bhliain 1984. Tugadh an leathanach seo cothrom le dáta an 16 Meitheamh 2017 ag 16:56.